Oh my! Where has this week gone?! I am terribly sorry for the radio silence. That needy project came back for edits and my work schedule has been all over the map. My apologies to those of you who checked in wanting letters! I really wanted to give them to you. Really! 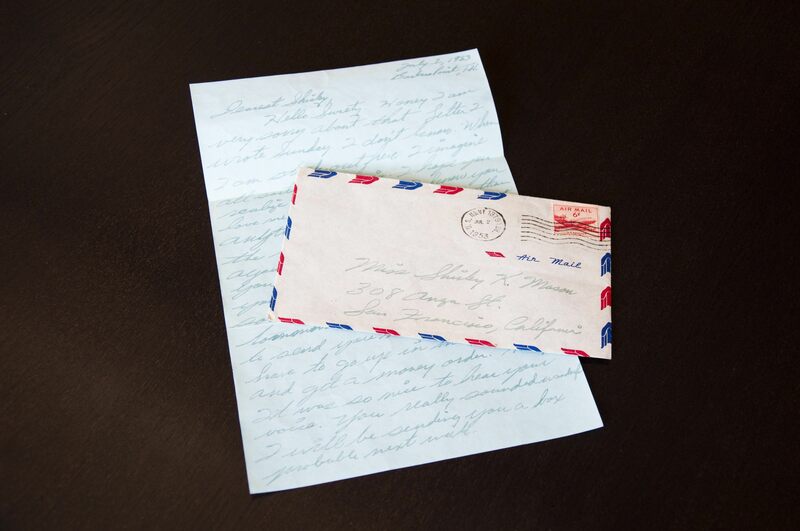 In an effort to assuage my gilt, I’m posting a bona-fide love letter from 1953. I found it today at the Brooklyn Flea, part of Dan’s Parent’s House collection. Ah, love letters are unparalleled, the champion of all written correspondence and by far the very best thing the postman delivers. I wonder what Shirley and Terry were like. Did they have a big fight? Did he think Shirley was unfaithful? And why does Shirley need money? I hope she used it to buy a polka-dotted dress and some dainty white gloves. And I just love that this letter was mailed before the invention of zip codes! Hello sweety. Honey I am very sorry about that letter I wrote Sunday. I didn’t know. When I am stuck out there I imagine all sorts of things. I hope you realize that honey. I know you love me and I love you more than anything. I am so sorry about the letter. That won’t happen again sweetheart. I just miss you so much and I worry about you so much that I imagine sorts of things. It will be tomorrow before I will be able to send you money because I have to go up in the morning and get a money order. Honey it was so nice to hear your voice. You really sounded wonderful. I will be sending you a box probably next week. I love you with all my heart. You are the most wonderful girl in the world and the only one for me. Tell your father hello for me sweety.